As tax day is quickly approaching (It’s April 17th this year, FYI), Americans are turning their attention towards their dreaded tax bill. Of course, not all taxes are created equally. In this piece, we break down the average tax cost by state. No one likes paying taxes. However, taxes are as sure a thing as death and… well, taxes. Your tax bill will vary depending on location. City vs City takes this into account when calculating cost of living. To determine the average tax cost by state, GoBankingRates.com calculated looked at the average cost in each state. Their ranking accounted for both state and federal income taxes, property taxes, sales tax and taxes on gas. All but one state where tax bills are the highest are clustered in the Northeast, and all but one state where tax bills are the lowest are clustered in the South. New Jersey has the highest average tax bill in the country, and the highest percentage of median income goes to paying that bill: 27.11 percent. West Virginia has the lowest average tax bill, but another state takes the lowest percentage of income in total taxes — Montana, at 14.54 percent. It means that your tax costs vary based on where you live. 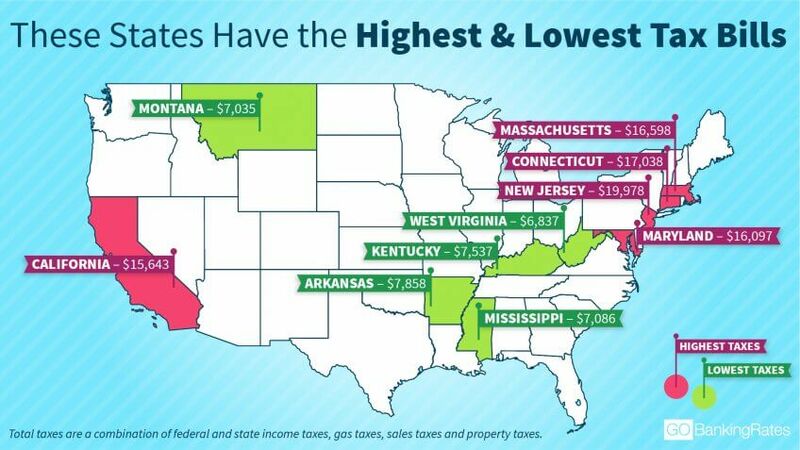 Some states have a higher cost of living than others. This is why City vs City developed an algorithm to rank cost of living and compare it with other cities across the country. City vs City was founded to determine what an individual would have to earn in order to take the standard of living they enjoy in their current city and translate it to another city. Without changing the standard, what would your new cost of living be? Well, if you moved from New Jersey to West Virginia; your costs would go down. Of course, the opposite is also true. This is why knowing your costs are essential before you decide to pick up and move on. If you’re thinking of moving to another city, don’t make a move without downloading the City vs City app first!